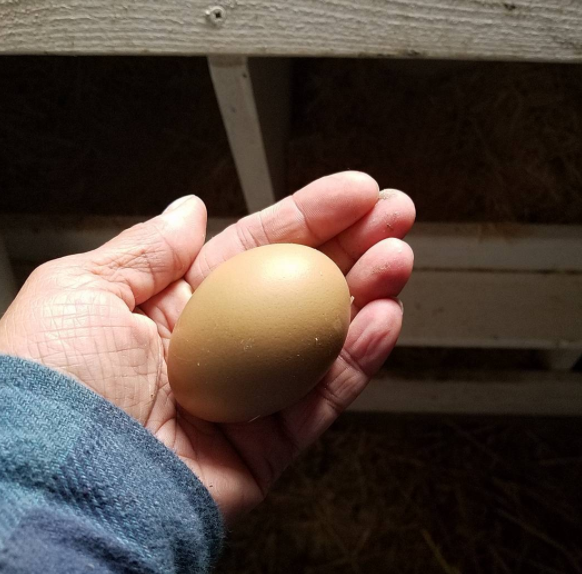 One of the nice things about raising your own chickens is knowing what they are eating and what is going into the eggs they lay. Another nice thing is knowing that your eggs are fresh. The average egg in the grocery store can be up to 8 weeks old by the time you buy it. Hopefully none of your backyard eggs will hang around that long, but if they do, here are some tips to keeping your eggs fresh as long as possible. Nesting box bedding should be changed often so it is always clean and eggs should be collected as often as possible. That way the eggs should be clean and not caked with mud or chicken poop. If any eggs ARE dirty, I rinse them immediately with warm water (cool water can cause bacteria to be pulled into the egg through the pores in the shell) and scramble them up for our dog or to feed back to the chickens. They are a super nutritious treat for the chickens and won't lead to egg eating in your flock. I promise you ! As a general rule, eggs should not be washed immediately after collecting them. There is a natural bloom on the surface of the shell that keeps out air and bacteria. Its important to leave the bloom intact in order to keep your eggs fresh. 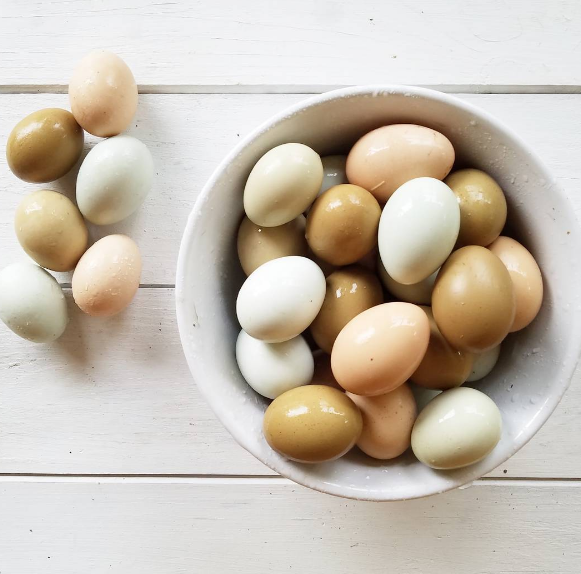 Eggs don't need to be refrigerated, but one day out on the counter at room temperature is equivalent to about a week in the refrigerator, so if you aren't planning on eating your eggs for awhile, it is best to refrigerate them. They will keep about seven times longer. The decision to refrigerate or not is a personal one. In the UK, Ireland and many European countries, eggs aren't even refrigerated at the grocery store. My grandmother never refrigerated the eggs from their chickens. She also left butter out on the counter...and lived to be almost 100 years old. Quick Tip: Eggs separate better if they are cold, but whites will beat higher and stiffer if they are allowed to sit at room temperature for at least 30 minutes. Eggs should always be stored with the pointy end down and the blunt end up. The air sac in the blunt end helps keep additional moisture from being lost. Since eggshells are porous and will absorb odors, they should be stored in a carton or covered container. A bowl with plastic wrap over the top works fine in a pinch. Eggs also freeze well, so I always freeze any extra eggs during the summer and fall to use through the winter when production drops. If you live in a cold climate, there's a danger of the eggs freezing outside in the nesting boxes and possibly cracking, so try to collect your eggs more frequently. Not Sure if an Egg is Good? 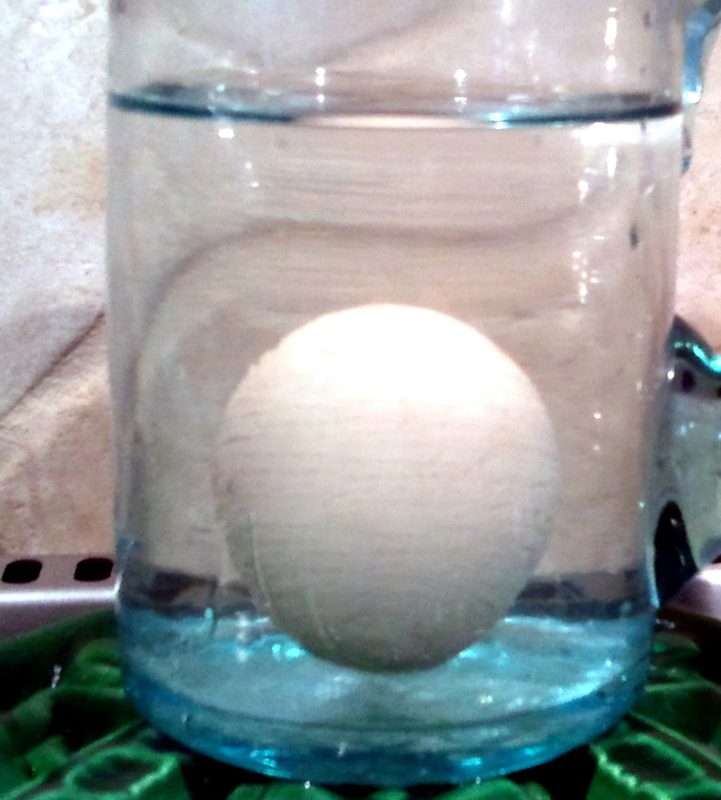 If you are in doubt as to how old an egg is, just do the 'Float Test'. 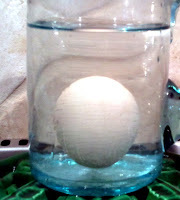 Drop the egg into a glass of water. A fresh egg will lay on the bottom of the glass. An egg that is two to three weeks old will start to rise up off the bottom of the glass. It is still perfectly good to eat, just not quite as fresh. It will also hard boil better/peel easier, but I steam eggs instead - that way I can use freshly laid eggs and not have to wait for our eggs to 'age' to peel easily. An egg that is two months old will start to angle up a bit more and by three months will stand up straight in the glass, but as long as one end is still touching the bottom, it's still perfectly good to eat. If an egg floats, it's very old and could be bad. I would toss it. When you are ready to use your eggs, simply rinse them under warm tap water. There is no need to use any soaps, detergents or commercial egg washes. Plain tap water works fine. Just be sure its warm to avoid drawing bacteria in through the shell. Save the eggshells, dry and crush them to feed to your chickens as a free source of much-needed calcium. Following these few tips, your eggs should stay fresh and delicious for as long as possible. Although if your household is anything like mine, they don't hang around long enough to be anything BUT fresh! I like to leave a dozen or so eggs on the counter to be used first and then refrigerate the rest. Partly because they look pretty and partly for the convenience. 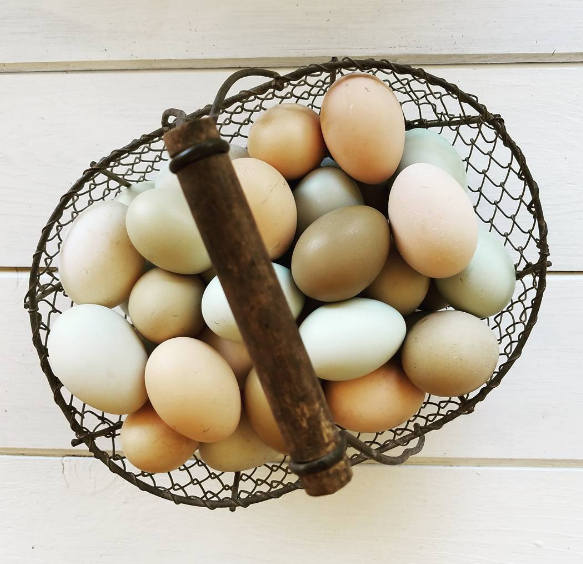 The bowl or basket of eggs out on the counter is a visual reminder of our wonderful, simple farm life. Just seeing them makes me smile. Very thorough! I know this information will come in handy for many folks. Thanks Becky...there is just SO much misinformation out there and we get the same questions over and over, so better to address them in a blog post. 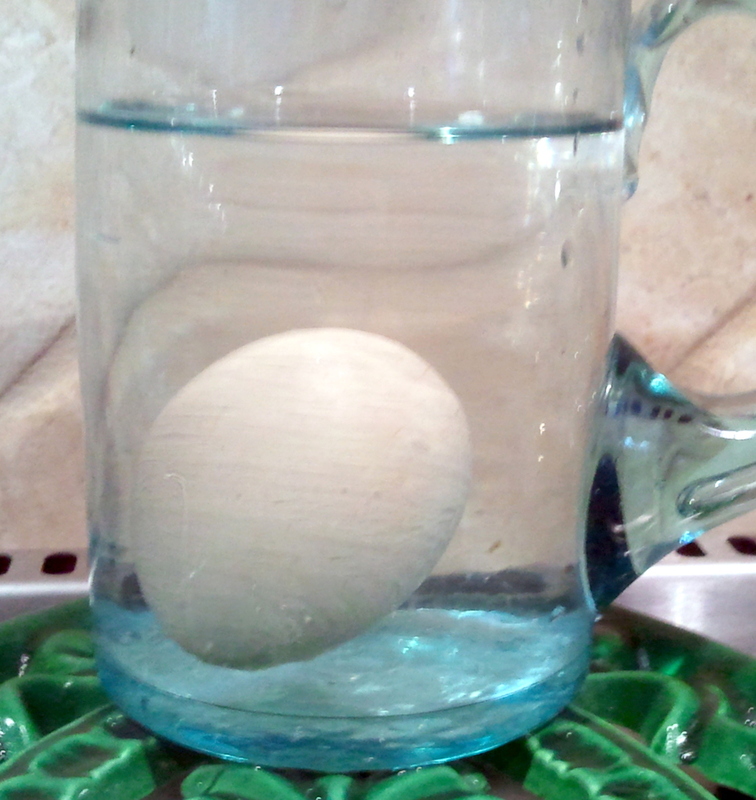 Do you agree with the timeline of leaving an egg out on the counter with your own Float Test ? Thanks for all the wonderful tips, I just got my first chicks this February and can't wait til they start laying!! Soon Michelle...I bet you're excited ! Thanks for the information! I was just wondering the other day about if/how long you could leave eggs out. Very interesting! I've been getting farm fresh eggs from my sister, but hopefully my Ameraucana pullets will start laying towards the end of this month! Intereresting about the Farmer's Markets. In Nebraska, all eggs sold must be washed with a suitable detergent. And those egg shells do well in the garden, too, especially around tomatoes if you have calcium deficient soil. It will help prevent blossom end rot. And it has the added benefit of keeping slugs at bay - the rough shells scratch their little bellies so they don't like to cross over them. Another excellent post Lisa, in our area we are also required to have a special poultry/egg insurance if we sell our eggs. Not a license, but insurance. Love the clear egg holders for selling 1/2 doz. We sell so many each day that sometimes I get "beggars" who still want any that they can get until the next morning. Hi, I was told by a rabbit breeder that eggs that reach the grocery store are about 3 to 5 months old. I was also told by a local senior that one of her sons or grandsons drives for a Grocery store chaing and confirmed that the eggs are quite old before they reach the store shelves which is why I raise my own chickens and i eat 4 hard boiled eggs per day and I also might have 2 or 3 extra I use to bake muffins, etc. So Eggs are very health for us, if raised by us. Thank you for all the info on how to treat new eggs straight from the chicken. Chickens are such fun to raise (not fond of most Roosters) but we keep wondering if we could buy eggs cheaper than all the feed we give the girls...is there a requirement amt for feed...we use scratch and crackle? You most certainly can buy storebought eggs cheaper - if you want to eat old, uninspiring eggs from chickens that are most likely mistreated and at the very least neglected. Scratch should only be fed as a treat in the winter. Not sure what crackle is but a bag of good quality layer feed costs around $14 here. Each hen will eat about 1/2 Cup per day - less if you supplement their diet with some supervised free ranging so they can forage for weeds and bugs, kitchen scraps and other leftovers. I am not sure my family will remember to always wash before use with warm water. I did not know we needed to do this if the egg looked clean coming out of the coop. Better let them know. I had no idea you could freeze eggs. Awesome info as usual! Thanks for all the information, Lisa. I can't wait to try my first fresh egg. It's always disappointing to me when I buy the freshest eggs I can find in the store, and they are obviously still really old. Great info!! Thanks for sharing. I can't WAIT to have chickens and ducks for eggs!!!! Thanks Lisa for the info!!! Our family never refrigerated eggs because there simply wasn't room and we did use them quickly. What info do you have and what are your recommendations for keeping eggs in the shell for long periods of time? Can they be kept safe and fresh tasting if oiled or waxed? And I have a hens who lays bullet shaped eggs, funny things, no blunt end. I also started dating my eggs in case they get mixed up in the kitchen - just a small number in Sharpie on one end. So ... one of my ladies has decided we should have an egg hunt... ours do free range when we are home ;) She WILL NOT lay in a nesting box... for a while there she was sooo sneaky we could not figure out where she was laying...for a week. I live at 6000 feet so even warm days are relatively cool... my concern is once we found the nest with all those eggs .... are they ok to eat after seven days outside? Hi Kimber! Sure they should be fine. If you're worried, just pop each on into a glass of water. As long as they don't float, they're good. Egg-cellent advice. There is no way my husband will believe you don't have to refrigerate...There is many things he believes must or must not be done that just aren't true but he'll never be convinced. I'm a city girl. I rinse my eggs (my chickens refuse to use the nest box no matter what I put in there) and refrigerate them. Since my girls lay them on the floor in the back corner of the coop they often get poop on them even when I gather them twice a day. I only have three pullets and I know that one of them will lay for me everyday between 11 and 12 so I try to get that one if I'm home. The other two girls are not as regular and only lay every couple days. a pencil works great too. and they must be refrigerated to sell in Virginia. Even for the small farm sales. But hey... No inspections unless you sell 150 Dozen a week!! You can get high quality safety equipment concept for the needs of your financing.These are available in various design, sizes and depending on your idea.We are cooperate with the customer and financial sector. I use a pencil on mine.